There is probably no latex compiler which supports parallel compilation. The short reason is: The way latex typesets documents is essential linear. If latex would typeset different document parts in parallel, they would need to be merged at the compilation. However to get the same result as in the non-parallel case, you would need to have a compilation run over the already typeset parts to connect them properly (pagebreaks, numbering of table, etc.). Hence you end up with probably the same compilation time or worse than before. The index and bibliography are usually generated independently. Thus makeindex/xindy or bibtex/biber can be called in two parallel processes. A (quite) small amount of time can be saved by using -draftmode for the first LaTeX runs except the final. With option -draftmode the output PDF/DVI file is not written, but all auxiliary files (.aux, .toc, ...) are created as usual. Why doesn't LaTeX compile faster? 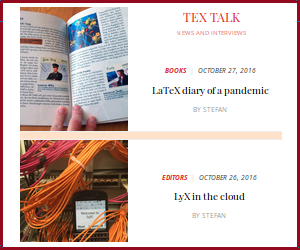 LaTeX editor with live preview for Windows and RTL language support? How to work with LaTeX such that files are interchangeable linux/unix/windows? Which PDF viewers for Linux support Beamer's second screen options? Which Linux distributions support recent TeX Live with package manager?